I remember grade one vividly. One of the brightest memories I have is our teacher explaining in great detail how to hold scissors if you're going to walk across the room OR hand them to someone. Nowadays I'm skeptical that those grade one scissors could in fact inflict an injury but I suppose, you never know. At the time I was riveted at the danger we were being entrusted with. Perhaps that's when I began to fall in love with scissors. (P.S. Dinky Doo has some super cute scissors. I love the little ones... they're just perfect for adding to present. Ooo and they have some Eiffel Tower ones too! See what I mean?! Scissors = excitement). Which is probably I loved sneaking my mom's pinking sheers for crafting when I was a kid. When I started working full time, after high school, I saved up for a good pair of sewing scissors. I still use them (and love them). I'm thinking my scissor are probably in need of a good sharpening. Back in June at the Fraser Valley Modern Quilt Guild meeting they invited Andrew from The Focused Edge to talk about sharpening scissors. If you're near Vancouver or in the Fraser Valley and are in need of a good sharpening, like me, you can contact Andrew through his FACEBOOK page... HERE. It lists all his rates and info. 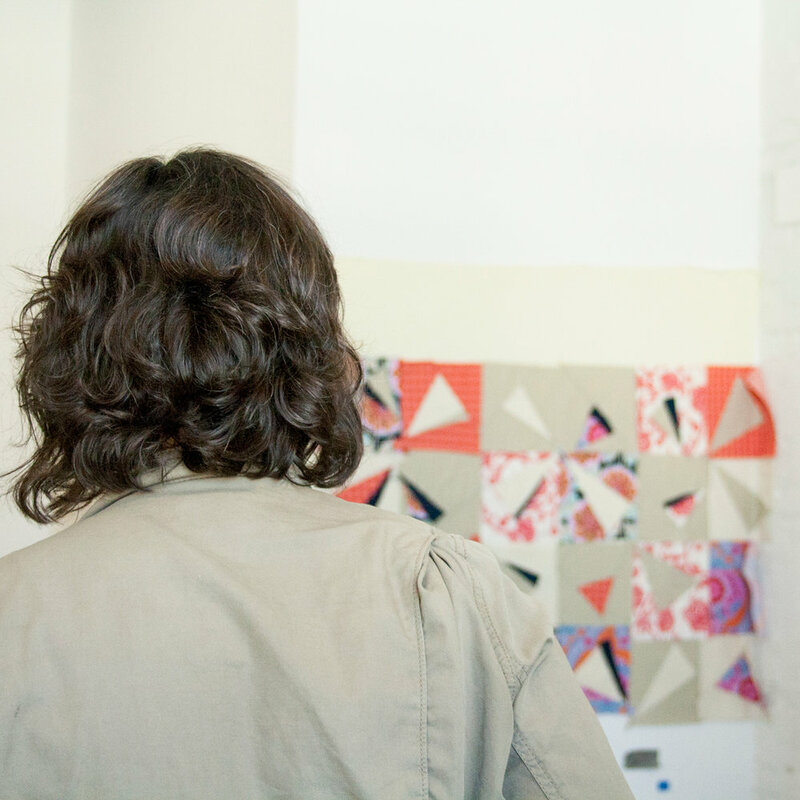 Have you seen Rashida Coleman Hale's SNIP, SNIP! Print? It's so beautiful! I may have just bought it for a certain someone who loves scissors WAY, WAY, WAY more than me. And I like scissors Aaaa lot BUT this person takes it to a WHOLE new level. Ooo! AND have you seen Lindsey Neill's @penandpaperpatterns new block of the month, SEWOLOGY? Have a look at those scissors!!! You can find it on Craftsy, HERE, among her other A-maze-ZING patterns. Gah! LOVE, LOVE, LOVE! RECOMMENDED FOR YOUR PLAYLIST: Now this is a bit of a twist. I was trying to think of a song about scissors and I discovered SCISSOR SISTERS. They're a bit disco-y but modern. Check out one of their performances on the Graham Norton Show, HERE. Stay for the the chat after, the bird impression is well worth it! Eventually it all gets done. Right? My husband and I both turned 40 the same year. We wanted to do something to mark this milestone. He jumped out of a plane. I took a Denyse Schmidt workshop in Portland. I didn't even know what the workshop was about... I thought maybe we were doing log cabins. It didn't even matter to me. I showed up with my two toned fabric and started the workshop making perfectly pointy pinwheels. Then we were instructed to deconstruct them. Wha huh? Okay. I was pleased with the experience but life happened and the blocks from the workshop were tucked away. Skip forward two more years. Back then I was still coordinating workshops for the Fraser Valley Modern Quilt Guild. We brought in Barb Mortell again. She had previously taught our guilds first workshop back in 2011 or 2012. This time she was teaching us all about triangles. I had known Barb for sometime and asked if I could go rogue and do my own thing. She said 'go for it'. 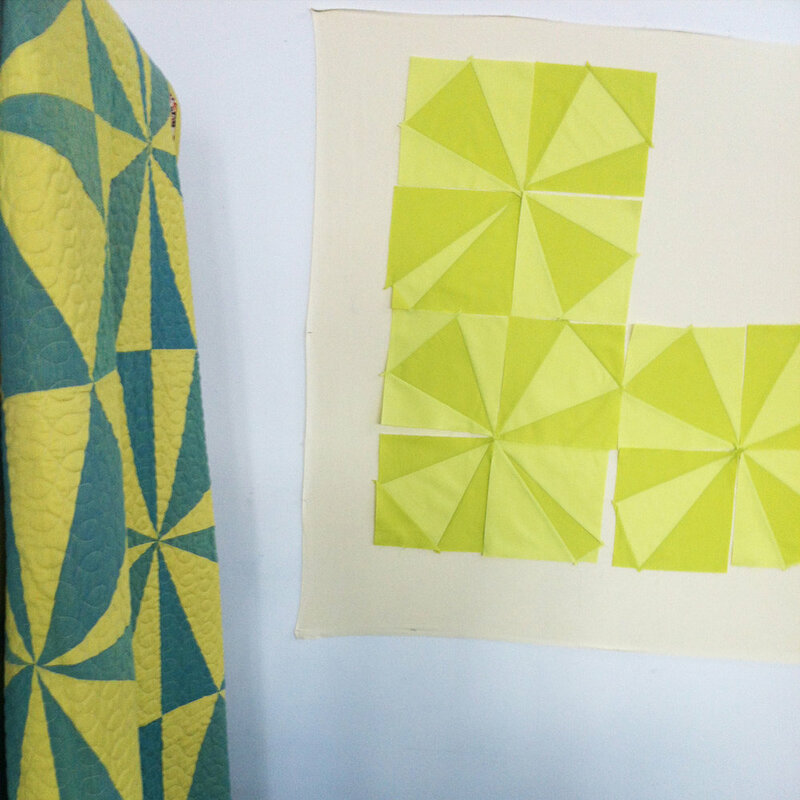 What I remember most about this workshop (which was two days of intense sewing) was feeling like I had found my voice in colour among all those triangles. I finished sewing the triangles together shortly after Barb's workshop. Last summer I put the wide boarder on and had it quilted by Bev Funk. I'm not sure where my motivation came from but recently I've been finishing up old projects. I didn't sign up for any finish alongs but darn it I should have! Oh well... Either way I'm happily satisfied with the quilt. It feels great to get one project done! Now only 1,293,286 unfinished projects to go!